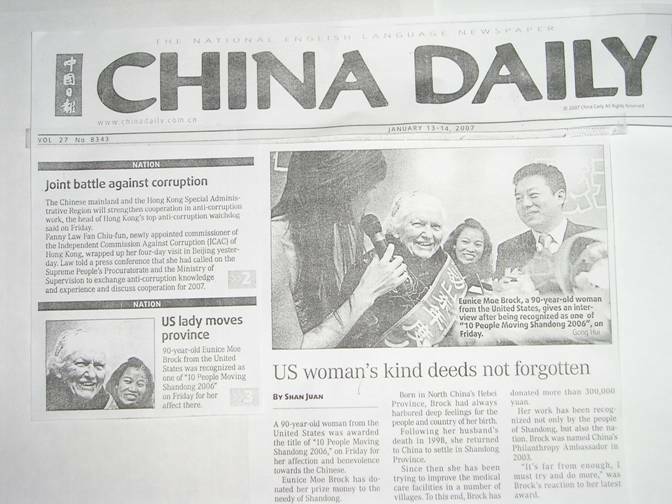 Eunice Brock is a friend of the Society for Scientific Exploration, and she is a friend of the Chinese people. Most importantly, she is a friend of the Earth, our only home. She gave me permission to post her letters which follow. One is to me, one to the Olympic committee, and the third to the Chinese people. They are full of wisdom and hope. But first, a newspaper clipping, with a picture of Eunice Brock, among friends. One Dream. Select the best one with a chorus everyone can join in singing. of Earth that is destroying Earth's capacity to support human civilization. leader to build the One World Dream we all hold in our hearts. whole world to action. It needs to be done. DO IT!!! We raise the banner of one world. we raise the banner of one world . working to build the world anew. To give our world dream birth! To build a paradise on Earth! thwarted women suppress their fears. The angry hopeless turn to crime. In taverns jobless curse their fate. Man of compassion now arise! Need despairing ones forever wait? the deaf to hear sweet melody. of education, jobs and health. from our Earth's water, land and air. Some of you may have seen on T.V. how I celebrated my 90th birthday. back to a very different China, one free of civil war and mass starvation. development that has brought China into a leadership position among nations. is it in dealing with the root cause of this crisis which is human behavior. brought about by the tremendous achievements of science and technology. called scientific facts. Many of the functions of the gods became obsolete. require other dimensions beside space and time for their explanations. these other dimensions will supersede the laws we presently assume as valid. "Way" is the by-name we give it. Chinese friends? In America if a child looks or acts like a parent we say,"
differentiate them from new varieties of flower seeds that are sprouting. celebrate the occasion with a birthday party.